HOLLOWAY AMERICA will offer information about its pressure vessel design and custom fabrication of reactor vessels and other pressure tanks for pharmaceutical and biopharmaceutical processes. HOLLOWAY AMERICA provides custom fabrication and pressure vessel design for pharmaceutical and life science companies. We’re excited to discuss custom fabrication and pharmaceutical equipment at the ISPE San Diego’s exhibit show. The organizers have truly outdone themselves this year. 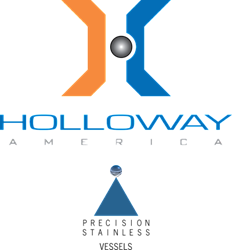 The pressure vessel design and custom fabrication company HOLLOWAY AMERICA today announced it will have an exhibit at the ISPE San Diego Chapter 22nd Annual Exhibit Show: Life Science Resource Fair on Thursday, August 14, 2014 at Green Acre Campus Pointe in San Diego, Ca. The event offers pharmaceutical, biotechnology and life science professionals the opportunity to discuss the latest advancements in industry equipment with HOLLOWAY AMERICA representatives and other exhibitors, all of which are valued members of the ISPE (International Society for Pharmaceutical Engineering). Asked what people can expect when visiting with HOLLOWAY representatives, Director of Marketing Randy Colwell replied, “We always have great discussions with attendees at ISPE events, because we have plenty to talk about. HOLLOWAY crafts numerous products for life science applications—from our renowned reactor vessel solutions, including heating and cooling tanks with dimpled jackets, to our industry-standard spring-assist H-Series Manways. We also offer many other products and on-site services that can optimize a customer’s processes to increase efficiency,” he stated. This year, the ISPE San Diego Chapter Life Science Resource Fair will take place on Thurs., Aug. 14 from 2 - 7 p.m. The event venue, Green Acre Campus Pointe, is located at 10300 Campus Point Dr. in San Diego. Attendance, parking and all events—including the “War Stories from the Plant: Successes and Lessons Learned” Facilities Panel—are free for pharmaceutical and life science industry personnel. Attendees will also be eligible to win various door prizes. Attendee Registration from 2 - 2:30 p.m.
Facilities Panel from 2:30 - 4 p.m.
Exhibit Show from 4 - 7 p.m.
For more information on the ISPE San Diego Chapter 22nd Annual Exhibit Show: Life Science Resource Fair or for details about the company’s custom fabrication and pressure vessel design services, contact HOLLOWAY AMERICA at 417.863.0077 or by email at info(at)HollowayAmerica(dot)com.